Well it didn’t take long for me to start tinkering with my Rift! I had seen a few tips and tricks to improve the quality of the Rift display, specifically the screen door effect (SDE), but I never expected them to work so well. I figured the most popular mods would involve switching out the screen for something with a higher pixel density, but I think mods like that would only be possible by those very good with electronics, who could make the changes required to not just the wiring, but also the board. The mod i performed involves adding a diffusing filter over the screen to try and blur the pixels a little, bleeding them into the black space between them, minimizing the effect. There are a couple of different ways people are doing this, some are using “privacy filters”, specifically the ones made by 3M to limit viewing angles and prevent people from viewing your screen from side on. These are pretty expensive and have to be applied in a particular way for it to work properly. It needs to sit a few millimeters off the display, using spacers or even some of that thick double sided adhesive tape. You also need to modify the plastic divider between the two eyecups that splits the LCD in to two sealed halves. If this is not cut down, it rests against the screen and squashes the space you need between the filter and screen, greatly reducing the effectiveness. The method I used was very simple. I had been placing the spare eye cups that comes with the Rift on my PC display, to see if I could recreate the screen door effect enough to photograph it. It worked a treat and was easy enough to see, so I started to try and replicate the diffusing effect with stuff I had around the house. I tried some photographic lens filters, but nothing worked, then I noticed some Matt finish gift tape in my cupboard. I layed this over the screen and looked through the eye cup, and it worked surprisingly well. The top half of the above image is the taped area. Last night I posted some questions on the MTBS forums about the 3M filter method, and someone replied with a link to another thread on the Oculus developers site about some alternatives to the 3M filters. One person had actually used several lines of the tape I used, but this quite obviously had some limitations, very noticeable seams and bubbles. Another method was using Thermal Lamination Pouches, which are just envelope size plastic laminator sleeves. These are simply layed directly onto the screen and taped into place. I couldn’t buy the exact pouches online, so I went to a a local office supply store this morning and got a pack of 25 80 micron gloss pouches for $4 to experiment with till I could find the right ones. I tore the pouch in half, using just one side, then cut it to size (6″x4″) and taped it in place, glossy side down using just two small pieces of tape on each side of the display. Initial tests on my Blackberry Playbook screen were not that promising, very blurry and too big a loss of definition. But after putting one on the Rift, sealing it back up and testing it properly, the results were fantastic! The film causes the pixels to bleed into the black space between them, reducing it by about 60-75 percent. It was literally a five minute job, and because i never expected it to be of any value, I took no care to avoid dust. I managed to only catch a few small speckles, which are pretty tolerable anyway as they are towards the top left corner. I might pop the screen off again one day to do a much cleaner and neater job, but I’m honestly happy enough to stick with this until the HD Rift is available. There has always been a few speckles of dust on my Rifts display since i got it, so i’m not even sure these are different ones. I played HalfLife2 after the mod, and it was so much more enjoyable. I played it for about 45 minutes and I honestly didn’t feel as much motion sickness either. Another bonus! 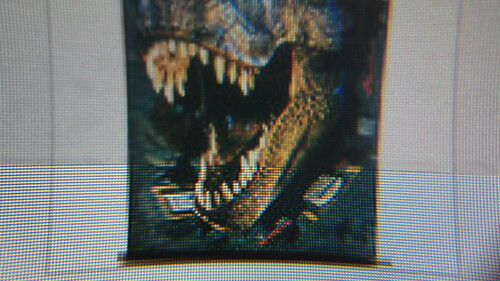 Watching Jurassic Park 3D was even better, the pixels all blended together and no longer looked like a blocky mess. Its amazing! The image i posted above is a pretty good indication of the strength of the screen door effect you get in the Rift. The pixel size will vary depending on your screen resolution, but the size of the black lines in relation to the pixels is pretty much spot on. The taped area is no way as effective as the lamination film though, it does a much better job. I highly recommend this to all Rift owners! The best $4 I’ve spent in a long time! ~ by newoldmate on 01/01/2014. Hahaah I think you shouldn’t have gotten the Rift before the end of stage 1 haahha I’m guessing now we won’t see many updates, just kidding! Haha. I’m kinda over the initial excitement, particularly because of Cryteks complete lack of support of it. No Crytek game has any support yet. Pretty lame. I’ll post about it and some other news soon once I get a few more things sorted and have a few new pics. Gabe Newell indirectly have you his blessing.